In this chapter, we discuss the management of simulation validation for complex simulation systems. We first present nine principles for simulation validation, which are important to achieve good management and determine the success of simulation validation. By considering these principles, we present a management framework of simulation verification and validation (V&V), which includes four components: V&V process, V&V scheme, V&V metrics, and V&V tools. That is, we adopt a process-oriented, optimized, quantitative, and automatic management manner for simulation V&V of complex simulation systems. We then describe each component of the framework in detail and discuss the involved management issues. 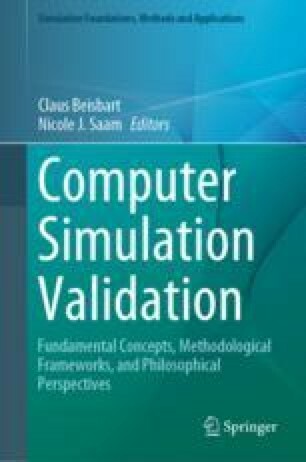 We hope this chapter could help the user to understand the management of simulation validation for complex simulation systems, and guide the user to manage the validation of practical simulation systems. This work has been supported by National Key R&D Program of China (2018YFC0830900), National Natural Science Foundation of China (61873094), Science and Technology Program of Guangzhou, China (201804010246), and Natural Science Foundation of Guangdong Province of China (2018A030313338).